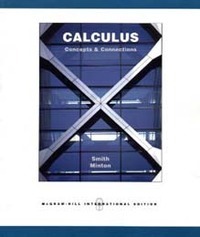 This modern calculus textbook places a strong emphasis on developing students' conceptual understanding and on building connections between key calculus topics and their relevance for the real world. It is written for the average student -- one who is mostly unfamiliar with the subject and who requires significant motivation. It follows a relatively standard order of presentation, with early coverage of transcendentals, and integrates thought-provoking applications, examples and exercises throughout. The text also provides balanced guidance on the appropriate role of technology in problem-solving, including its benefits and its potential pitfalls. Wherever practical, concepts are developed from graphical, numerical, algebraic and verbal perspectives (the "Rule of Four") to give students a complete understanding of calculus.